Starring Maya Rudolph, Will Ferrell, Jadon Sand, Brooklynn Prince and featuring the voices of Chris Pratt, Elizabeth Banks, Will Arnett, Alison Brie, Nick Offerman, Charlie Day, Tiffany Haddish, Stephanie Beatriz, Channing Tatum, Jonah Hill, Richard Ayoade, Ben Schwartz, Noel Fielding, Cobie Smulders, Jason Momoa, Ike Barinholtz, Ralph Fiennes, Will Forte, Jimmy O. Yang and Bruce Willis. Screenplay by Phil Lord and Christopher Miller. Distributed by Warner Bros. 107 minutes. Rated PG. Being the oldest of four, I could relate with young Finn (played by Jadon Sand) at the end of The Lego Movie when his father (played by Will Ferrell) tells him that their newly shared Lego sanctum will now also be shared with his little sister. The feeling of dread, of prescient knowledge that for a small child, destruction is more fun and makes more sense than the build, is a horror story waiting to unfold – every time they rebuild, the Duplo aliens return to destroy. This end twist, completing the simple story of a dad who takes Lego play way too seriously, is where our new story The Lego Movie 2: The Second Part, begins. Like the original, The Lego Movie 2 has a simple underlying human story line filled in with Lego details for days. This time, the story focuses in on the siblings, big brother Finn and little sister Bianca (played by Brooklynn Prince of The Florida Project) as they “try” to play together, which, as most siblings know, never really works. They are constantly under the threat of “Ar-mom-ageddon” where the Legos will be banished. The story beautifully captures the spirit of siblings, the love and the conflict, the nature of a little sister looking up to her big brother, just wanting to be a part of his world. After all, he gave her her first Lego creation and she responded with a Duplo army, armed and ready to destroy (because, duh…that’s how play works). Despite my best intentions, I really loved the first Lego Movie – maybe it was watching the world of Lego’s through the eyes of my daughter. The creators took a simple, iconic toy and gave life to its very monotonous, and at times painful, existence. Lego Movie 2 expands upon this and makes it easy for the audience to understand the similarities and contrasts between the created worlds of a big brother and a little sister – from toddler origins, to pre-teenhood. 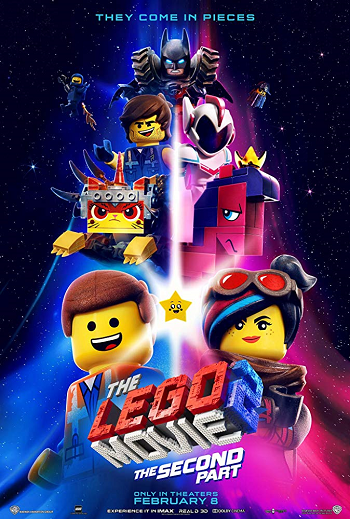 Lucy and Emmett return to lead the Lego 2 star-studded cast – Lucy (voiced by Elizabeth Banks) is still dark and stormy, easily brooding in her dialogue and voice. Emmett (voiced by Christopher Pratt) is the yin to Lucy’s yang, her special best friend. For the most part, Emmett has lost the flare of being “The Special” from the end of the original film. He is less of a master builder and has regressed back to his happy go lucky self, seemingly more out of place than ever now that their world has been under attack for five years. He promises to adapt to their darker post-apocalyptic world. When Lucy and others are kidnapped by General Mayhem (voiced by Stephanie Beatriz) and taken through the Stair Gate to the Sis-Star System for a 5:15pm Matrimonial Ceremony, Emmett is determined to get Lucy back. The story splits here following both Emmett in his hero recovery plan and Lucy as her fellow captives get a taste of manipulation and mind control complete with Royal makeover by Queen Watevra Wa’Nabi (voiced by Tiffany Haddish). Batman (voiced by Will Arnett) takes center stage in this story line as the Queen uses reverse psychology to convince Batman to be her groom. It’s pretty adorable. One of the joys of this sequel is the creativity employed in the Lego characters and world as created by little sister Bianca. Her creations seem so age-appropriate as she grows from her Duplo age to her grade school self. She builds more detailed objects and worlds, while maintaining her little sister flare. The Justice league gets a happy makeover complete with glitter (even Jason Mamoa’s Aquaman) in the Sis-star system and bombs shaped like hearts and stars cause emotional scarring from their cuteness before they explode. I am happy to report that there are fresh new renditions of “Everything is Awesome” to get stuck in your brain – which are far more satisfying than most of the other new songs in the soundtrack. Batman has a couple of noteworthy musical solos that cracked me up. But the most creative, entertaining song comes at the end of the movie, during the end credits – worth staying in your seat, at least until the song is done. The Lego Movie 2 is a more than satisfying sequel to the original – for sure a film that you will be happy to go to with your family. My screening was in the IMAX format. I was happy for that because there were so many fine details that I was glad not to miss. I also had the opportunity to watch the film a second time in Regal Warrington’s new 4DX auditorium – the first in Pennsylvania! The Lego Movie 2 was really well suited for this “immersive” technology, where there are motion-synchronized seats, bursts of air shoot by your head in gun battles, water sprays (with an option at your seat to turn off that feature!) and more. Seat movements include roll, pitch, heave, back and bottom shakers. There are scents and bubbles, fog and ankle ticklers (my least favorite part…. too many opportunities to simulate creepy crawlies). Good news, in spite of the movement, my water stayed in the cup holder and my popcorn did not spill all over my seat. The seat is firmer than the newer recliner seats but is really comfortable for movie viewing. For sure, people with pre-existing motion sickness sensitivity should steer clear of this auditorium – but if you like theme park rides, this is a fun way to get your thrill fix on. Copyright ©2019 PopEntertainment.com. All rights reserved. Posted: February 8, 2019. Tags: 4X, alison brie, Ben Schwartz, Bonnie Paul, Brooklynn Prince, brother, Bruce Willis, channing tatum, Charlie Day, Chris Pratt, Christopher Miller, cobie smulders, Duplo, Elizabeth Banks, Ike Barinholtz, immersive, Jadon Sand, Jason Momoa, Jimmy O. Yang, Jonah Hill, Lego, maya rudolph, Mike Mitchell, movie review, Nick Offerman, Noel Fielding, PA, pennsylvania, Phil Lord, PopEntertainment.com, ralph fiennes, Regal, richard ayoade, sister, Stephanie Beatriz, The Florida Project, The Lego Movie, The Lego Movie 2, The Lego Movie 2: The Second Part, The Second Part, Tiffany Haddish, Warrington, Will Arnett, Will Ferrell, Will Forte. Bookmark the permalink.